Olly and I are heading away to the East and West Scotland Summer School tomorrow morning from Saturday to Saturday. We are looking forward to catching up with all our friends and making new ones. There is wi-fi in the school we are going to... so I'll keep you posted with whats going on. Chris and I intend, as part of the media elective, to encourage the kids to start their own blog... create the content etc... I'll post some links for you to check out as soon as I have them. So yeah... please keep us in your thoughts/prayers... and if you are going to the school or either of the festivals then give me a shout. And got you paying someone else's dues? Is anybody here made out of stone? I found these lyrics... taken from "Out of the woods" very inspirational this morning. Don't you just love it when a poet or singer captures exactly how you feel?!? Our previous officers popped in tonight for a blether... and Olly & I are so glad they did. they are such an encouragement to us... and genuine friends. no agenda... just meaningful, uplifting inspiration. We are grateful to have them in our lives! One of my friends at work suggested I check out "Conservapedia" (I wont link to it). I have never read so much right-wing biased, hate-filled nonsense in my life. This is the kind of crap that gives Christianity a bad name. 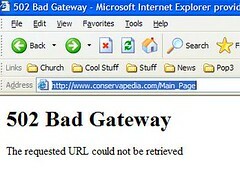 The only truth I found there was this 502 error... it is a BAD GATEWAY indeed. 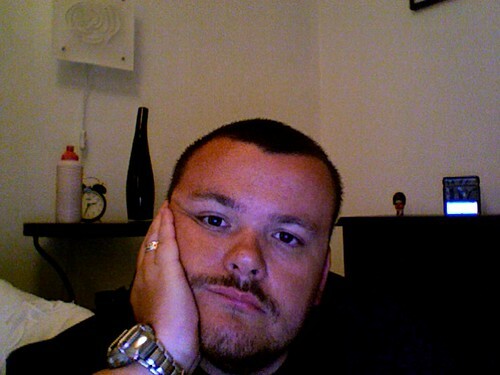 OK... so I was ranting about this website. Read Paul's comment... he caught me out. I believe in the Jesus he quotes in his comment that he quoted from the website... so yes the BAD GATEWAY isn't the only truth in this website. It was a rant! Thing is... I think my rant is justified. This website gives belief in Jesus such a bad rap... it makes me furious! All its nonsense just distracts people from gems of truth... like its statement on who Jesus is/was. We’re usually looking forward to find innovation. What’s the next big thing? What’s coming next? Future! 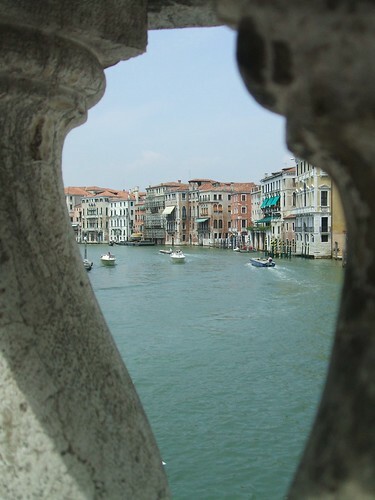 At times though, looking backwards might provide a richer source of inspiration. Overlooked ideas lay in wait to be revived. Simple practices long forgotten may be the answer to a present problem. There’s also the cyclically recurring retrofitting of culture, most obvious in the fashion world. Iconography of an earlier age is appropriated and remixed into a hybrid form using past style values to make a statement. This paragraph from one of my fave blogs caught my eye today... and its been circulating around my head... orbiting, if you will, as I considered possible implications. I look at the concepts/ideas/inspiration of emerging missional expressions of faith... and I see people trying to rekindle old ideas... revive simple practices that have been overlooked in the modern world. Its an ancient/future thing... looking back beyond all the nonsense to a time when things were more aligned... and then seeking to apply these ideas to now... and to the future. Celtic Christianity is one such source of inspiration... for me, anyway. I also look to the origins of the Salvation Army and consider what the movement could be if we weren't so parochial in our thinking and so obsessed with our ways... and our separateness. Back to days where the fire was hot. I don't want those days back... I want new days filled with new experiences... but I would be a fool to forget my past... or try to base my expression of faith on the sands of recent days. Seek inspiration where ever you can find it... but make it work for now... don't follow slavishly like some retro-obsessive. We need to remix the past to bring it into now. We've been back for nearly a week and our break still doesn't feel like a distant memory. We had a great break... time at the beach... time at the pool... time walking & hunting in Venice and Jesolo itself. I managed to read 2.5 books... I finished the irresistible revolution and a fun yarn called this present darkness [a fave book of Olly's and one I should have read a long time ago]... and got well into The Shaping of Things to Come: Innovation and Mission for the 21st Century Church... and have to say... I am inspired. 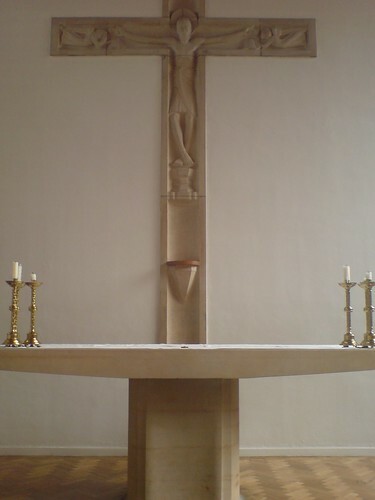 whereas the Shaping of Things to Come highlights all that is flawed with Christendom model of church... it is attractional (you go to church), dualistic (splitting the world into sacred and secular) and hierarchical (clergy and laity)... the very things I have been arguing against but not had the words I have now. I agree fully with Frost & Hirsch in that the church that will rise up in today's post-Christendom era is incarnational (church goes into the world), messianic (everything is sacred) and apostolic (leadership based on spiritual gifts and not position). I believe we need an approach to church that fits with the culture of our time... something in the world but not of it (unlike most churches that are separate (attract the extract) but act like the world (hierarchy)) but one that is grounded in the Word as well as the Word Made Flesh. Frost & Hirsch have given me hope that this is possible. Otherwise... my tech detox was a worthy exercise... one I will repeat and one I recommend heartily. It help me to remember the joy of reading... and the pleasure of being with my family. My head was cleared... and I was able to see the pictures the Lord wanted me to see [more on that later]. Being back... I was able to meet with Paul C for coffee on Thursday to catch up and talk about new missional opportunities. I was also able to catch up with Innes J for a coffee on Friday to talk about his iPhone and discuss why he should get a Mac [his topic of conversation, not mine]. We talked about Frost & Hirsch too and I am grateful that he has allowed me to keep the book... I feel it will be an invaluable reference resource in the months and years to come. Later on Friday... Olly and I were able [blessed] to pick up iPhones... and then headed over to Kenny & Sarah's for an indoor barbecue... with Janey & Roscoe too. Good times! Great to spend time with my family, if you know what I mean? A real blessing... with great food too! So yeah... its great to be back... I will post some thoughts from Jesolo soon... and talk more on Frost & Hirsch... and my iPhone. A photo of Olly's handiwork... her first attempt at guerrilla gardening... has been picked up by nowpublic.com for their article on how today's revolutionaries are growing their own food. Not sure why... her work wasn't about creating food but creating beauty from decay... but glad of the inclusion, nonetheless. 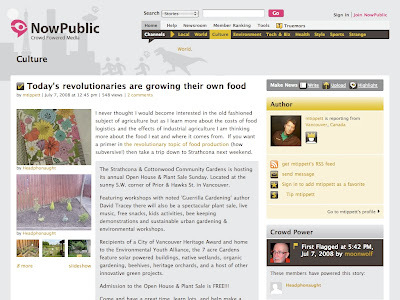 nowpublic is a participatory news network which mobilizes an army of reporters to cover the events that define our world. In twelve short months, the company has become one of the fastest growing news organizations with thousands of reporters in over 140 countries. 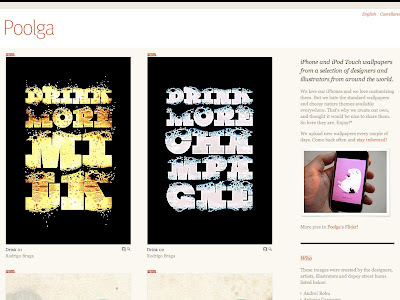 Came across the Poolga site while surfing on the notcot site - its a fantastic collection of wallpaper for customising your iPhone or iPod Touch. Check it out. 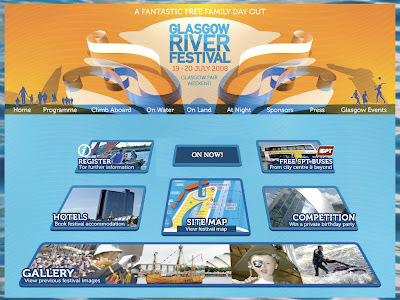 Going to the free Glasgow River Festival tomorrow... hopefully when the weather is better. If you are in/around the Glasgow area... you should check it out. Not much for free these days. I have uploaded 351 pics from my break on Flickr - I haven't managed to name them all yet... so please bear with me. Please leave comments. Let me know what you think. Ooops... forgot I was away for a couple of weeks. 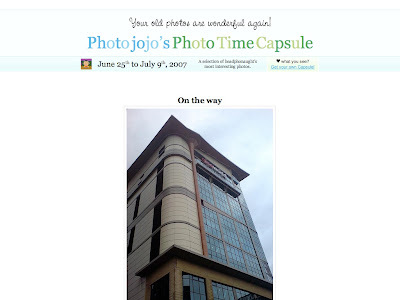 Here is my photojojo timecapsule for the period :: July 9th to July 23rd, 2007. Enjoy... I did. Thought this pic was awesome... with great commentary to make you think. 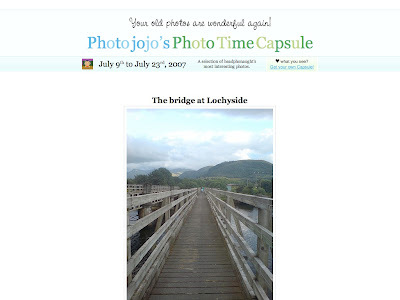 Here's my latest photojojo time capsule - check it out. I really... really... really... need to go to bed. Its beyond late... I am major league tired after a 30 something hour coach journey... so the 300+ emails and the 1000+ posts in Google Reader need to wait... but ooh... here's something about BIC introducing a disposable phone and aahh... I can stream Last.FM to my iPhone (if/when I get one). One thing I promised myself whilst away was to benefit from my internet detox... this feels more like a relapse... and I am only in the door 3 hours or so. Tried to tackle the 300+ legit emails in my Mail.app and found a couple relating to the Derek Webb album "the ringing bell" (thanks to JD and Rob for hooking me up) - I checked it out... followed the instructions (gave the emails of 3 close friends) and downloaded the album. Haven't listened to it yet... but I like Derek Webb and am stoked to add it to the 6 CDs I picked up in Jesolo for listening (all the way there with only an iPod and no way to listen to music on CD... how terribly 00's of me). 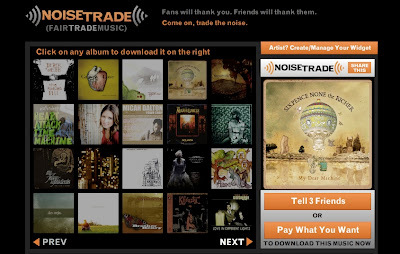 I love the concept... getting new music directly to the fans... and hope to check out other bands on the site (please continue to love me if you get emails from noisetrade). Check it out... and hook me up with music you think I'll dig.